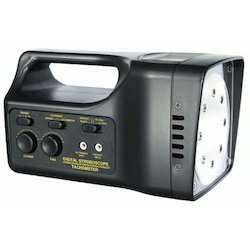 Bright Medi-Weld Appliances excels in rendering a qualitative range of Digital Stroboscope, which is offered to the clients at leading market prices. The Tools are highly appreciated by Construction Engineers, Professionals, Students, Researchers, Govt.Agencies etc. We have a range of latest Engineering Tools which are Simple to use, Less Time Consuming, Accurate & suits your application. Intelligent, microprocessor circuit design, high accuracy, wide range, digital readout. 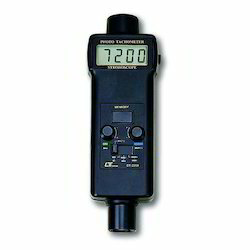 One instrument include two functions of " Digital Photo Tachometer " & " Digital Stroboscope "
solid state high visible orange light, long life, almost maintenance free. It is ideal for inspecting and measuring the speed of moving gears, fans, centrifuges, pumps, motors and other equipment used in general industrial maintenance, production, quality control, laboratories and as well as for schools and colleges for demonstrating strobe action. visible LCD display gives RPM reading exactly with no guessing or errors. The use of durable, long lasting components, including a strong, light weight ABS plastic housing. Cabinet has been carefully shaped to fit comfortable in either hand. Display:5 digits, 10 mm ( 0.4" ) LCD ( Liquid Crystal display ) with function annunciation. Accuracy:± ( 0.1 % + 2 digit ). Sampling Time:1 second ( 60 RPM ). Battery:4 x 1.5V AA ( UM-3 ) battery. Operation Temp:0 - 50 C (32 - 122 F). Operation Humidity:Less than 80% RH. Size:215 x 65 x 38 mm, (8.5 x 2.6 x 1.5 inch). Stroboscope range : 10 to 99,999 RPM.